Data is big business! It's the world's most valuable resource. Named the 'oil of the digital era' by the Economist, the abundance of data is fundamentally changing the nature of business as we know it. With advances in robotics, artificial intelligence, and machine learning ushering in a new age of automation, leaders in every sector will soon have to grapple with the reality of big data and how they can use it to drive business innovations. While most businesses know that more data means more insights, better decision-making and ultimately, when the right action is taken, a boost in profits, many are unsure of how to implement such strategies. Start small, take little steps, and build your plan out from there. The online retail giant, Amazon, unsurprisingly has access a lot of data... Not only names and addresses but also search history, basket abandonment and purchases. While this information is used to inform their advertising strategies, suggest you further products to purchase, Amazon are also using this data to improve their customer relationships. The Amazon customer service team have access to the most pertinent information about you, including your recent purchases and any problems that you may have had with your orders. This allows for a faster and more satisfying customer service experience, keeping their customers coming back. They are also a leader in 'collaborative filtering' which analyses your previous purchases, your shopping cart, your wish list, which products you review and rate/ don't rate and other customers data to recommend additional products that it thinks you'll be interested. This method increases amazon's revenue by 30% annually. Intel have been harnessing the power of data analytics and big data for years! They have an extremely rigorous and complicated process for testing their processor chips which was time consuming and sometimes problematic which led them to predictive analytics for a solution. Using the power of big data and analysis, Intel were able to significantly reduce the amount of tests that each chip had to go through for quality assurance. Their performance report said:“With sensor data collected from the equipment in each factory, the manufacturing IT data analysis team developed a tool able to process over five billion points per day of sensor data”. Intel explained that this has dramatically reduced the time needed to analyse and focus on key areas of manufacturing equipment from four hours to just 30 seconds. They were warned of a possible bacteria contamination in their stoned fruits and rather than send out blanket communications to all that had shopped their, they were able to individually contact everyone by phone who had purchased those specific items within the affected time frame, they then also followed this up with a personalised letter. Not only did this prevent their customers from potentially becoming very poorly, but it also helped to improve their customer loyalty and avoid any possible bad press. Would you like to discover how data analytics can help you to unlock your business insights and discover how to successfully optimise your processes, catch any 'suspicious' trends and leverage artificial intelligence? If you would like to discuss the power of data analytics with me in more detail, please connect with me on LinkedIn or contact us below. 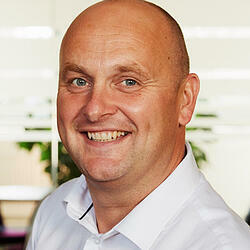 Martin Clothier is the Technical Director at Columbus UK. He has over 20 years of experience in managing the technical aspects of enterprise resource planning and other digital technologies in the manufacturing sector. Martin focuses on helping organisations reach their potential by bringing real-life business use cases of new technology to fruition through extensive planning, research, development and execution. In a world where technology is connecting almost everything, whether it’s the electrical grid, phone systems, cars or the appliances that heat our home and cool our food. IoT continues to thrive, so does the threat of devastating cyber-attacks, for example last year’s ransomware attack that hit the NHS and disrupted their operating systems. With the development of technologies these attacks are becoming more sophisticated and more common.